I’ve worked with David for over 5 years on our corporate events, ranging from intimate dinners for only a handful of guests to large Christmas parties catering for over 500. David is the most reliable, unflappable and most conscientious person I have ever worked with. He takes great pride in his work and rightfully so, as the output is always fantastic. 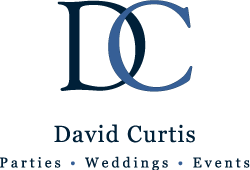 I have had the pleasure of working with David Curtis for the past 15 years and consider him to be the party planner of choice. His attention to detail is second to none with precise execution, and I can always sit back, relax and enjoy when I am in David’s capable hands. He has organised corporate and private, town and country events for me, each with its own personality and nothing less than perfect. I’m delighted to recommend David Curtis as The Event Planner we have turned to over several years: and always with much success. David has worked with The Family on many varied projects and events, including family occasions, third party events and political gatherings. We have pleasure and no hesitation in recommending David. For the past three years we have used David and his company to organise our annual Christmas Party for our clients. I cannot express how easy David makes thing for us. Every party to date has been a great success, amazing food, plenty of drink and fantastic entertainment. After initial consultations with David, he just takes the pressure off of you and the party is put together effortlessly. David is always around on the day and the evening of the event and manages everything, and should there be a problem (we have never encountered any!) he is there on had to sort it out. I cannot recommend David enough and we will be using him again in future. He has also helped us organise entertainment for an party we were arranging in Greece. You can always rely on David Curtis to produce delicious, beautifully presented food and to deliver an impeccable service. His attention to detail is second to none. His staff are delightful and always very well presented. David Curtis is consistently reliable, creative and professional in his approach. We can not recommend his services highly enough. Chanel has worked with David Curtis on numerous events from small press events to major VIP parties for many years. We used David Curtis for a client dinner which included a fashion show by Graff Diamonds. The whole event was excellent in every way, from conception, creativity and content through to execution. Excellent attention to detail I would not hesitate to use them again. David was creative in his ideas for the party, thought of issues that hadn’t occurred to me, was able to deal with my daughter’s somewhat mercurial and disorganised thought process and in short was a joy to work with on this project. At all stages your calm and experienced presence was enormous support and you managed to please all of us which is quite an achievement! I cannot recommend David highly enough. His creativity and enthusiasm combined with project management skills and attention to detail make him the perfect party organiser. My Fiancé and I asked David to help with the planning of our wedding. This was including finding the venue, advising on all aspects including cars, flowers, photography, arranging a tasting for the food and wine, band, service etc. We had a fantastic day and David and his team helped make the occasion so very special. David was reliable, efficient and showed great attention to detail and was a calming influence!